These two titles tell us about main characters who rose from rags to riches. They also tell us a great deal about modern fashion history. 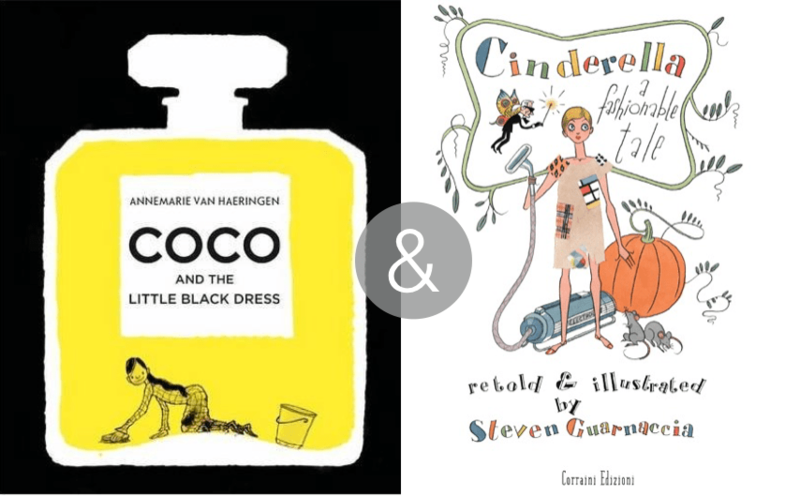 The first is a biography of Coco Chanel, the second, a Cinderella retelling with a fashion-centric twist. Coco and the Little Black Dress by Annemarie Van Haeringen (2015). 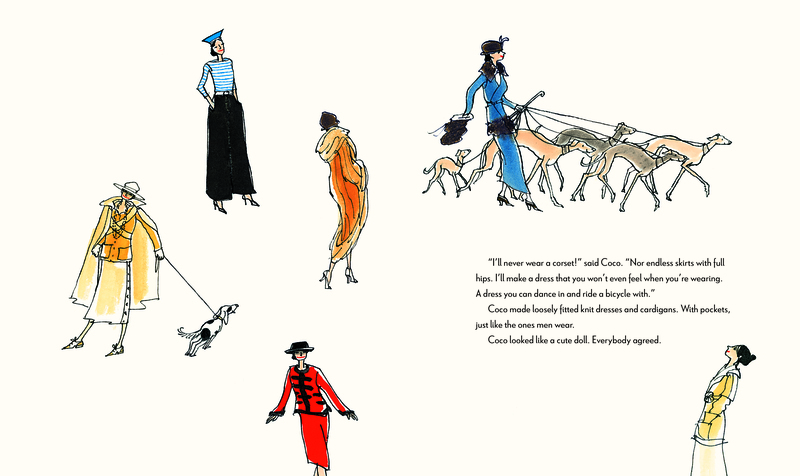 This picture book biography focuses on how Coco Chanel came from nothing and succeeded through her own hard work and ingenuity, that she bucked conventions of femininity, and that she has had unfathomable influence on fashion right up until today. She embodies simple, sophisticated cool. 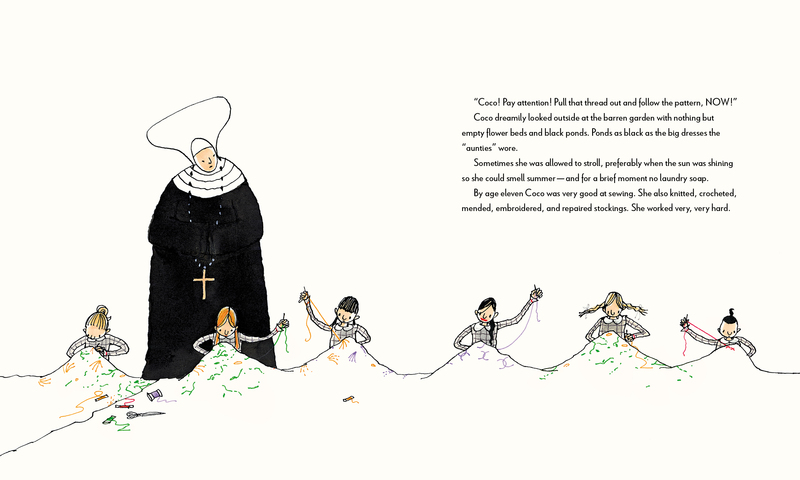 Coco learned to sew and embroider in the convent where she grew up after her mother died. I love the image of that giant nun looking over the girls and can’t help but notice its simplicity and starkness, a signature for Coco’s later self. I also love how Haeringen has given young Coco red lips. Another signature! “I’ll never wear a corset!” said Coco. “Nor endless skirts with full hips. I’ll make a dress that you won’t even feel when you’re wearing. A dress you can dance in and ride a bicycle with.” And that’s what she did. Coco made hats for wealthy people, but hats that were less ridiculous than the day’s typical fare. She made a classic perfume. And, yes, she popularized the little black dress. 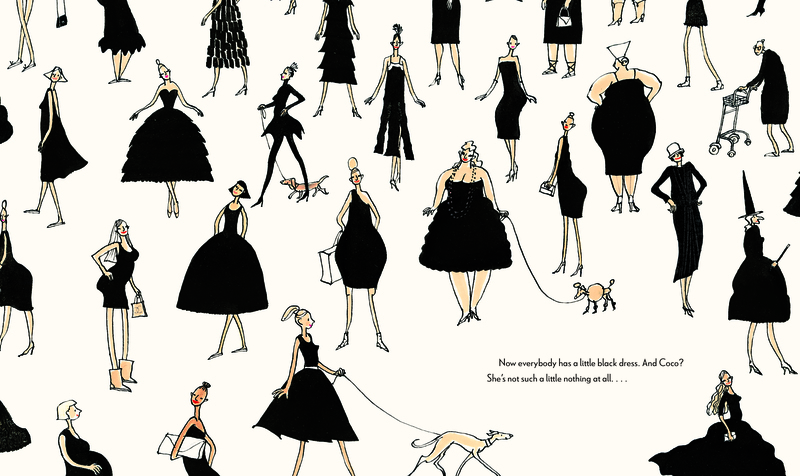 Big thanks to NorthSouth Books for images of Coco and the Little Black Dress! 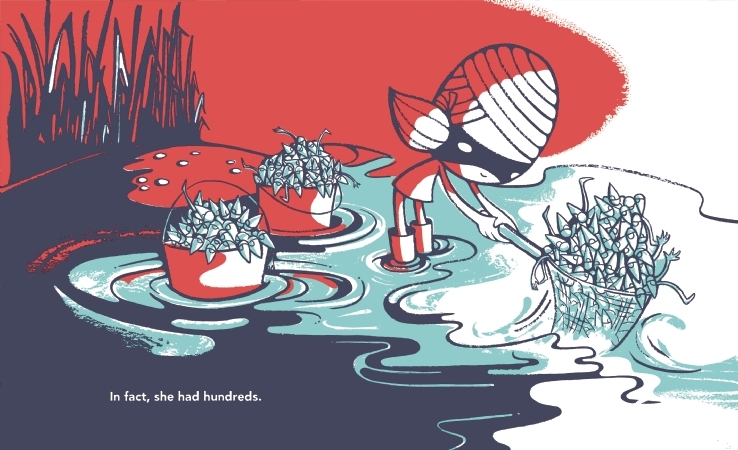 Cinderella, a Fashionable Tale by Steven Guarnaccia (2013). “Cinderella” is full of fashion. The gown, the shoe!! Guarnaccia’s version makes perfect sense! 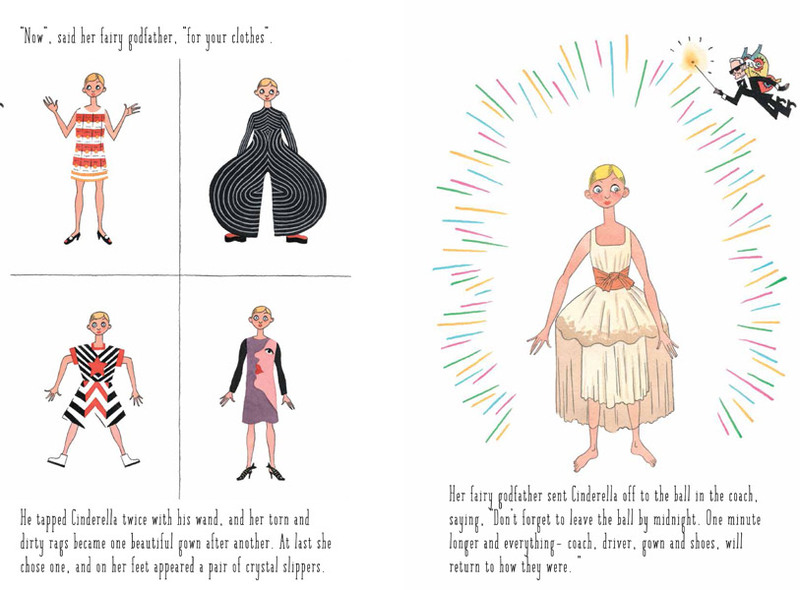 It’s a fairly traditional telling but with illustrations brimming with famous frocks. You may notice that this Cinderella looks a lot like Twiggy. 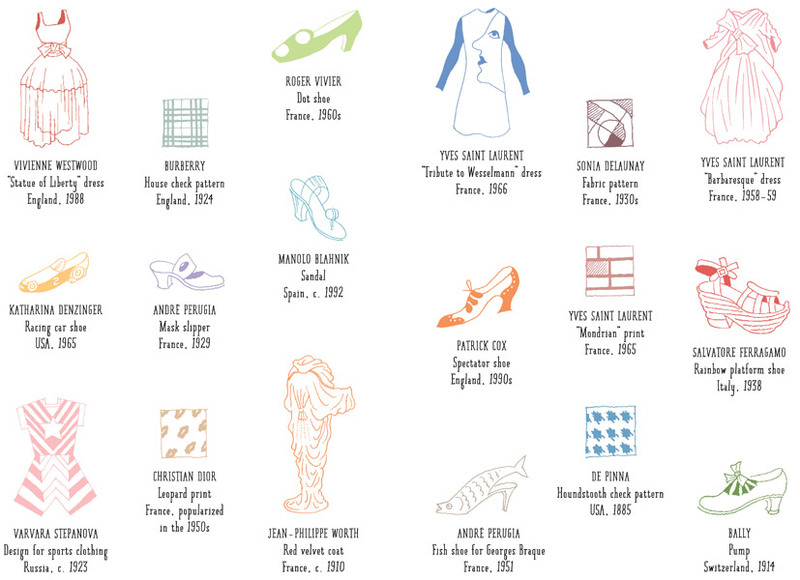 One nod to fashion history of many! And of course Cinderella and her fairy godfather must try on more than one gown to get it just right! 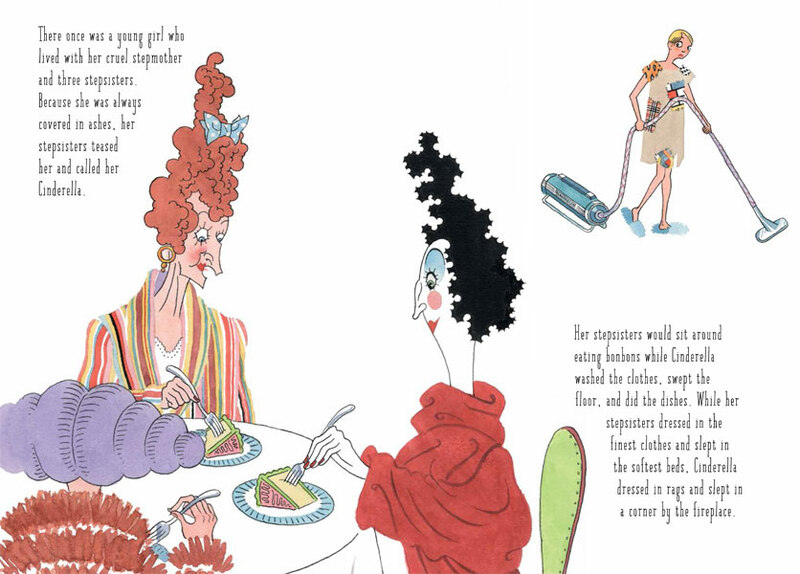 The book has a 60s modern feel; only the cruel stepsisters feel decidedly older-fashioned. 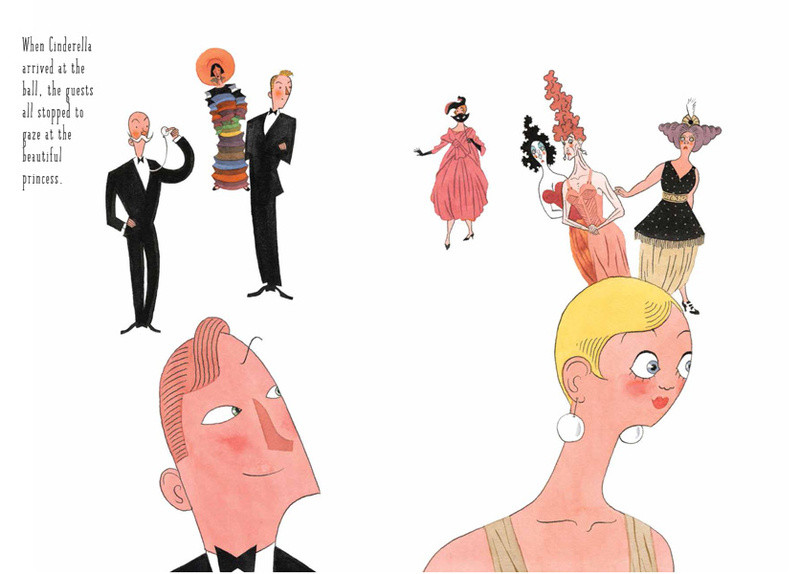 The endpapers serve as a kind of visual glossary and I love how this book could be a perfect foray into fashion for a future dressmaker. Images of the book from Steven Guarnaccia‘s website. 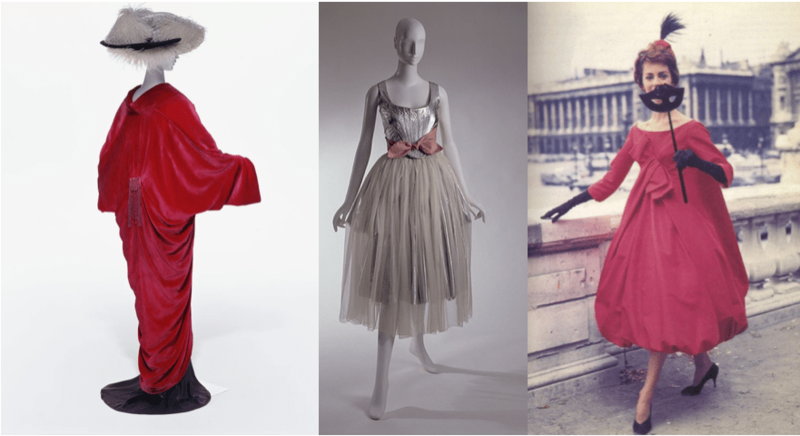 Left to right: Jean-Philippe Worth Red Velvet Coat; Vivienne Westwood “Statue of Liberty” dress; Yves Saint Laurent “Barbaresque” dress. 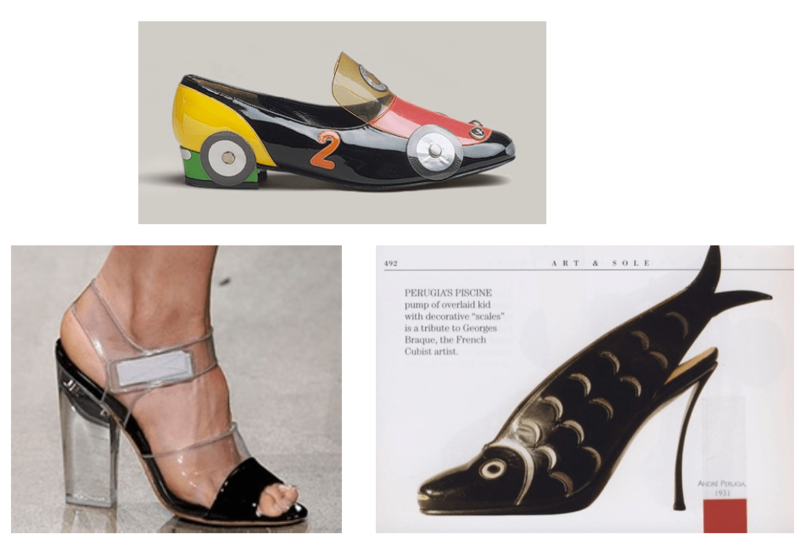 Clockwise: Miuccia Prada PVC sandal; Katharina Denzinger racing car shoe; André Perugia fish shoe for Georges Braque. 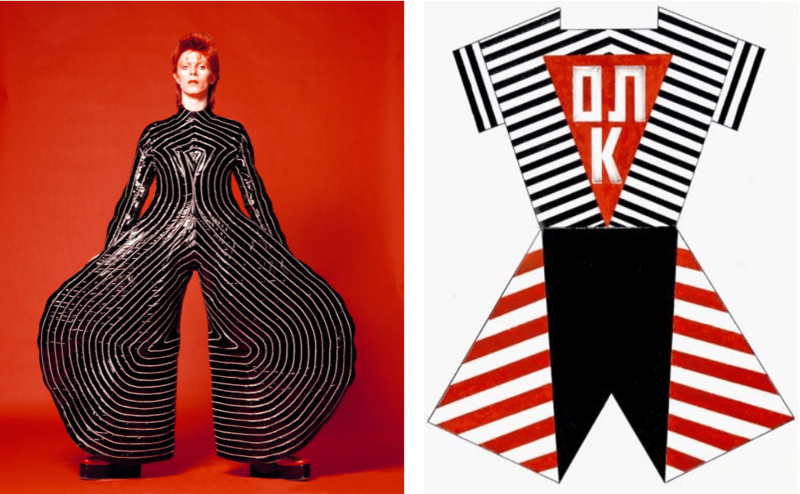 Kansai Yamamoto bodysuit designed for David Bowie; Varvara Stepanova sports clothing design. You might also be interested in my post on Happy Birthday, Madame Chapeau for some history of fashionable hats! 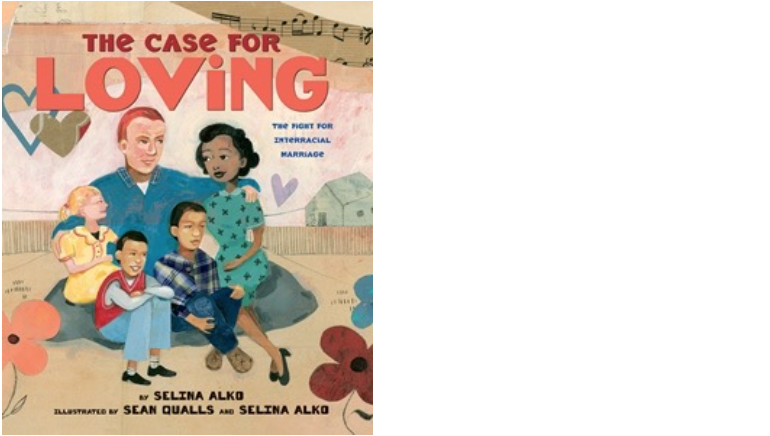 The Case for Loving by Selina Alko, illustrated by Sean Qualls and Selina Alko. This book. It’s by an interracial couple about an interracial couple in the past, the Lovings, who went to court to fight for the legality of their marriage and changed everything. 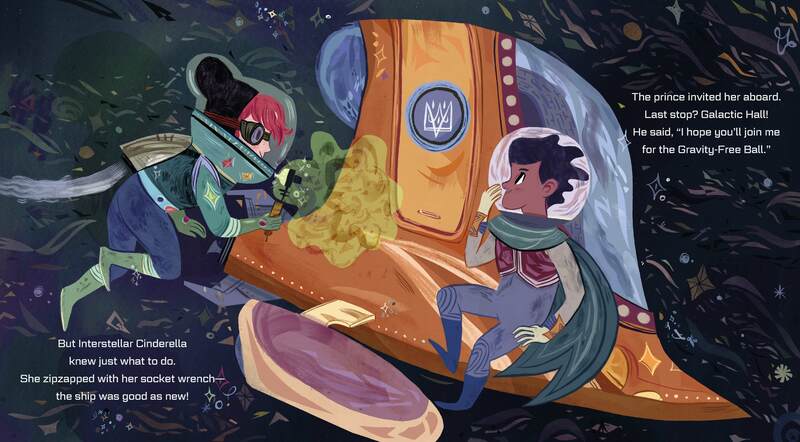 Qualls and Alko combined illustration techniques to create a truly special, collaborative book with love at its center. 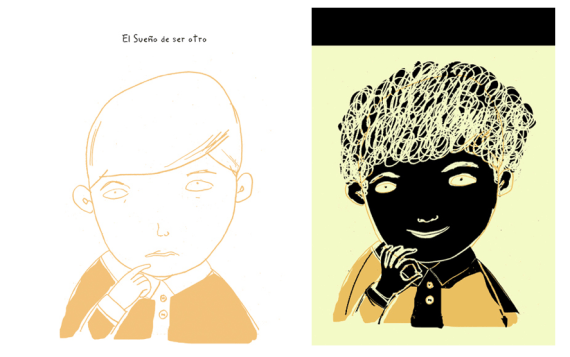 Growing up Pedro by Matt Tavares. Even if you’re not a baseball fan, I guarantee this story of two brothers looking out for each other will get to you. 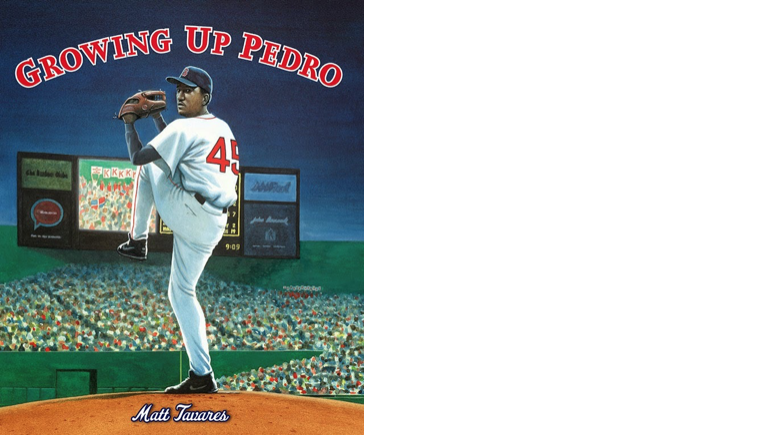 Pedro Martinez was once a kid growing up in the Dominican Republic, dreaming of the major leagues. This is the story of how he got there and the relationship with his older brother that sustained him. 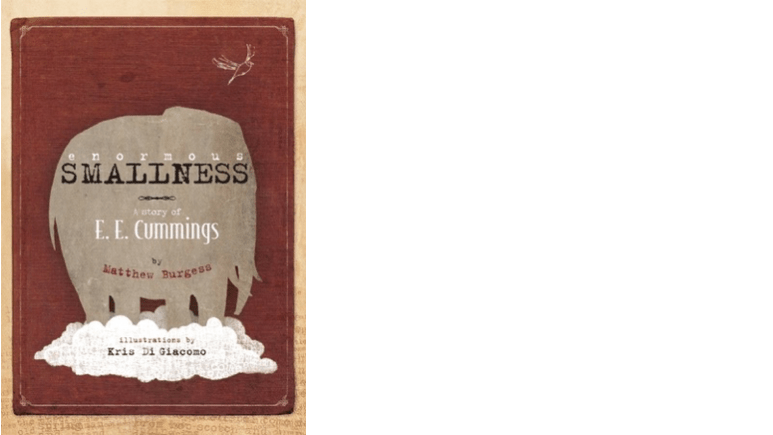 Enormous Smallness by Matthew Burgess, illustrations by Kris Di Giacomo. This biography of E.E. Cummings is moving because of its beauty—in illustrations and layout design and in poetry. Not only that, but it’s infused with spirit and the idea that you can accomplish your dreams with courage and by staying true to yourself. Yes. 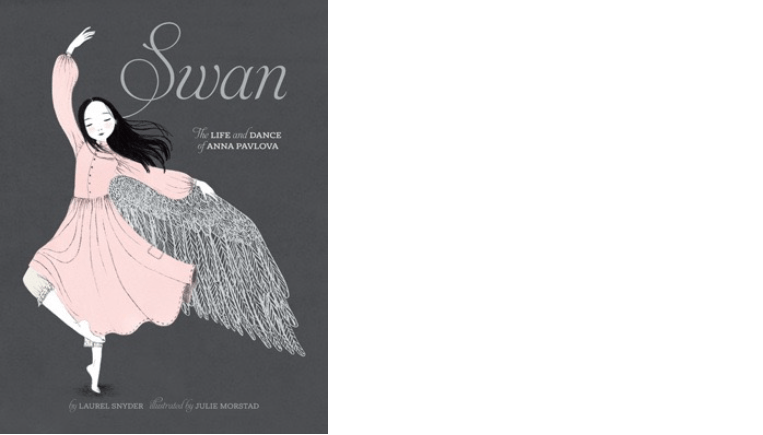 Swan by Laurel Snyder and Julie Morstad. 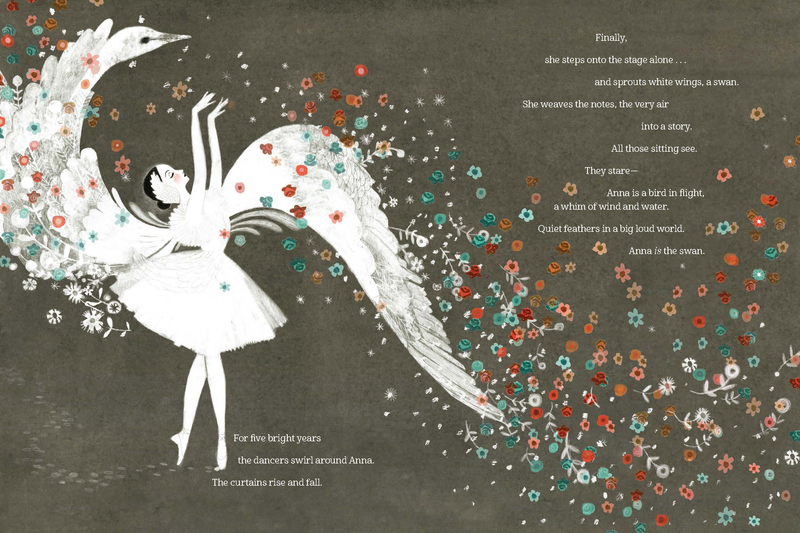 The perfect combination of joy and melancholy, this tribute to Anna Pavlova’s life (and death) brings sweet, satisfying tears. 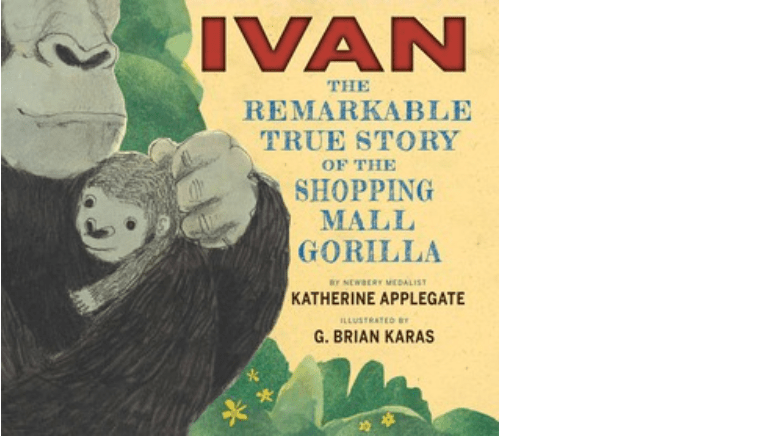 Ivan the Remarkable True Story of the Shopping Mall Gorilla by Katherin Applegate, illustrated by G. Brian Karas. If you loved the middle grade novel, The One and Only Ivan, then you’ll love this pared down picture book version for younger readers. It gives us the real life story of a gorilla captured from his home and family, living an isolated shopping mall experience, and then finally finding a new home and companions. 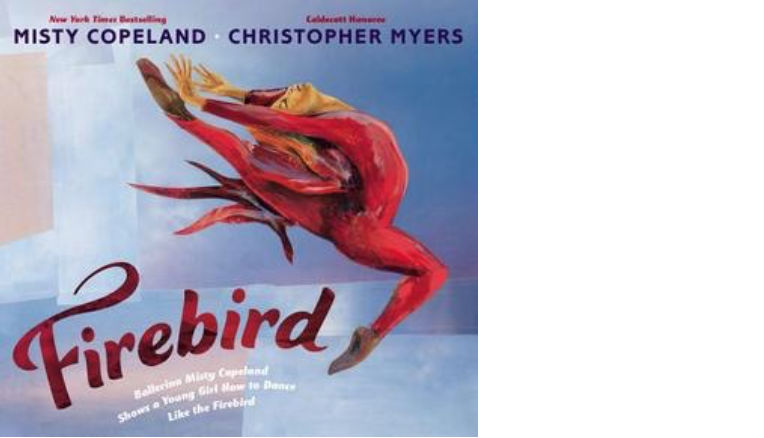 This book will make you feel things because of who wrote it (principal ballerina Misty Copeland) and how she did so. And it will make you feel things because of who it’s addressed to: young people with dreams that seem far away to impossible. 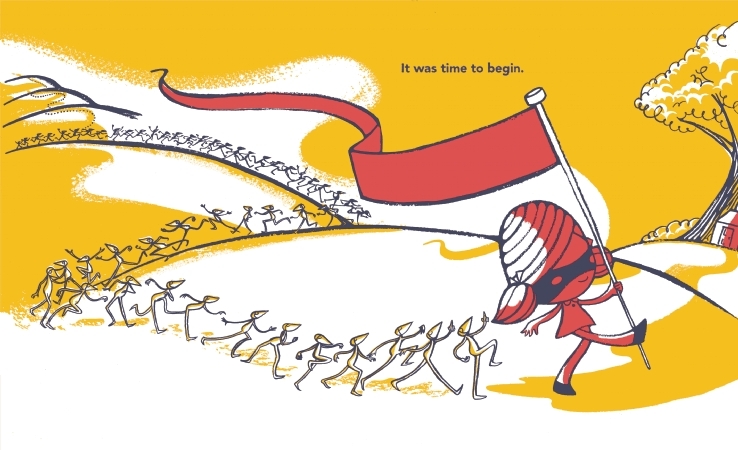 Plus those vibrant, fiery illustrations that dance on the page. And finally, one to look forward to! 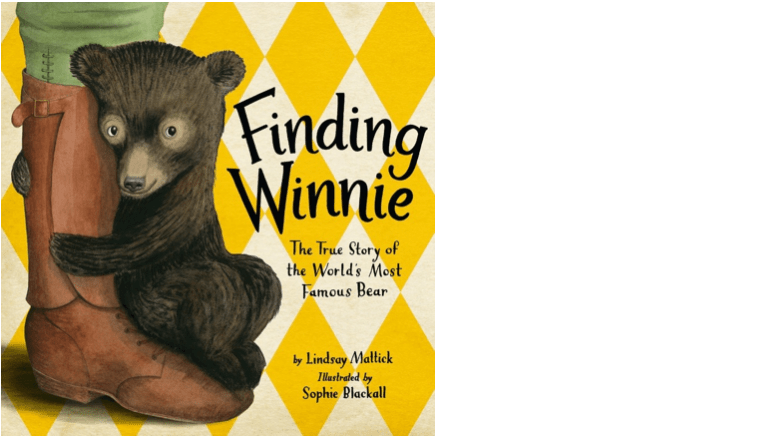 Finding Winnie by Lindsay Mattick, illustrated by Sophie Blackall (out in October!). 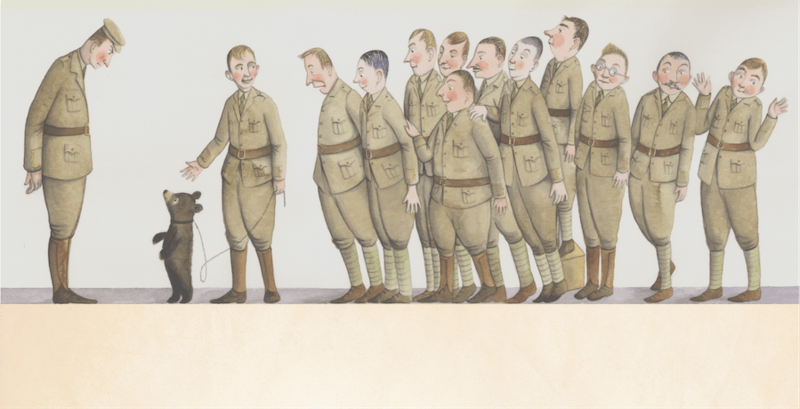 Thanks to Little, Brown and Company for the image of Finding Winnie. 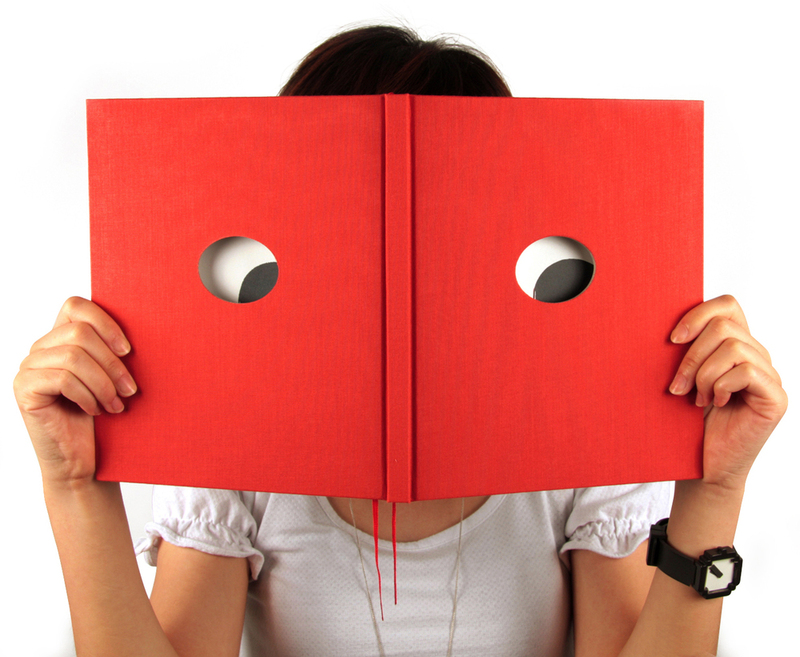 Any tear-inducing (in a good way) non-fiction picture books to add to the list? 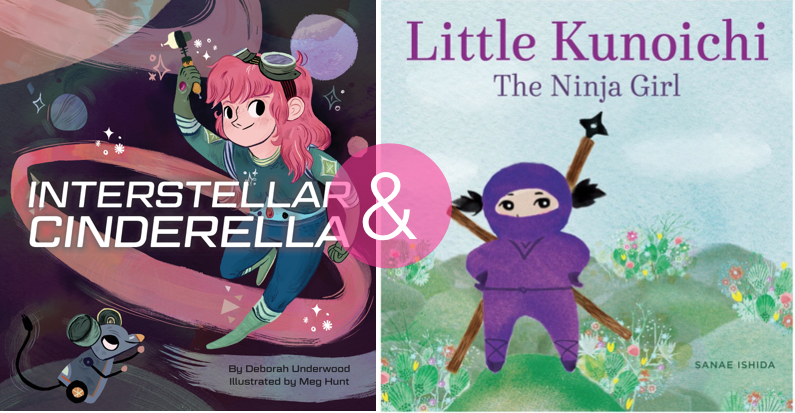 Today I’m pairing two picture books with strong girl characters—one mechanic and one ninja-in-training. 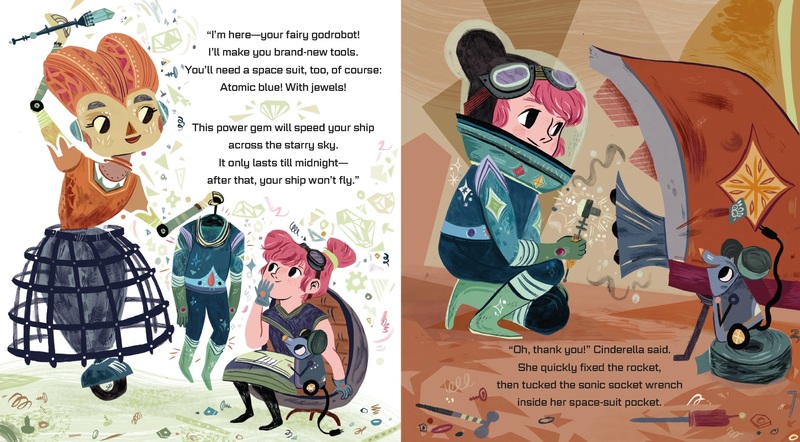 Interstellar Cinderella by Deborah Underwood, illustrated by Meg Hunt (2015). The rhyme really shines in this girl power book. 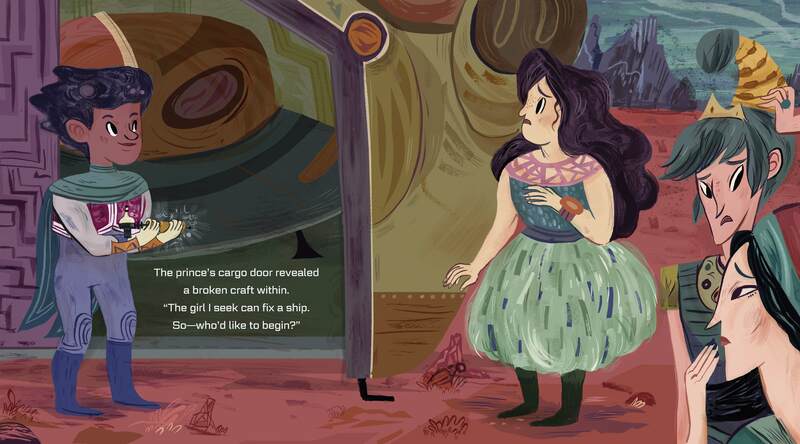 It’s a Cinderella retelling of a character who dreams, not of a prince, but of fixing rockets. Yes! No gown for her, but a bejeweled space suit and sonic socket wrench. And a mouse named Murgatroyd. Yes, again! “She thought this over carefully. Her family watched in panic. 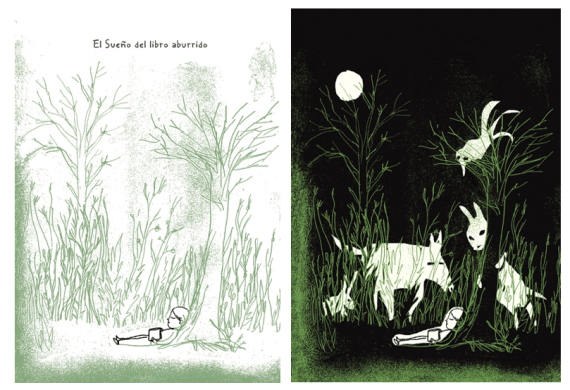 Thanks to Chronicle Books for images! Little Kunoichi: The Ninja Girl by Sanae Ishida (2015). The artwork in this one is what really gets me. 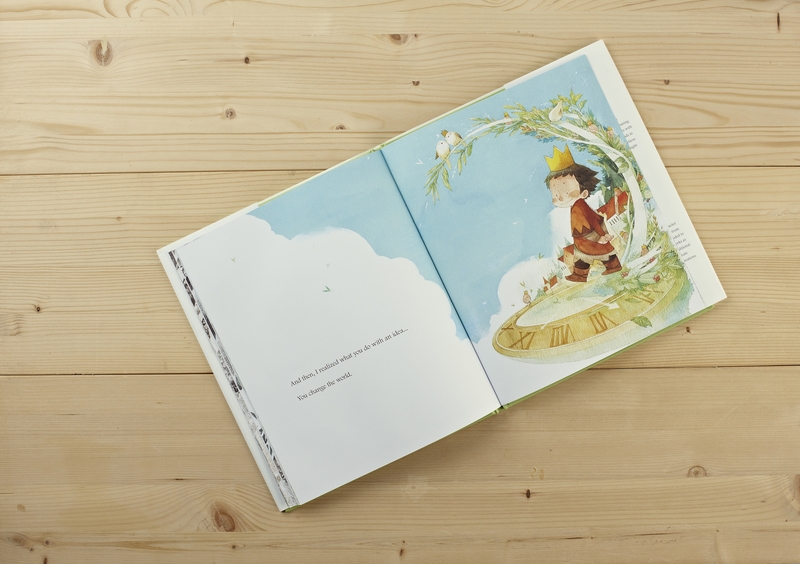 Those watercolors are so sweet, dainty, and colorful; I want to live in this book! 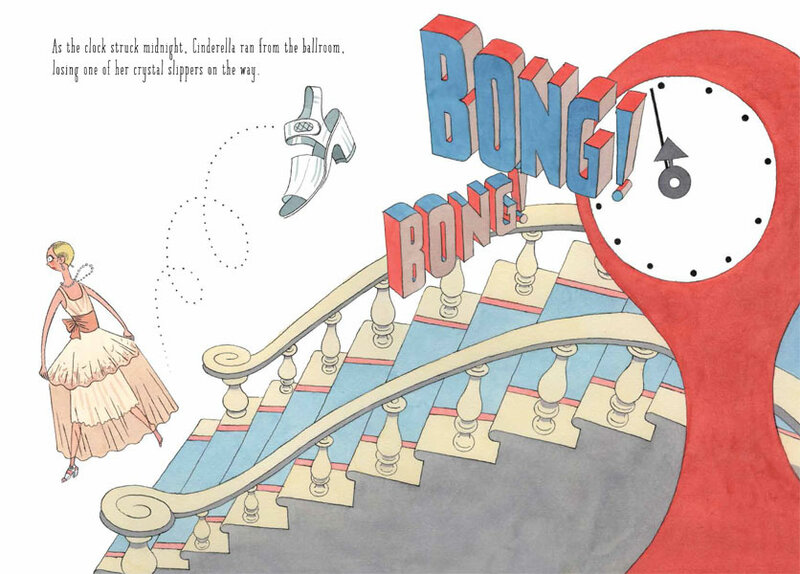 The illustrations match the whimsy of this story as well as its message of fun without rigidity or perfection. 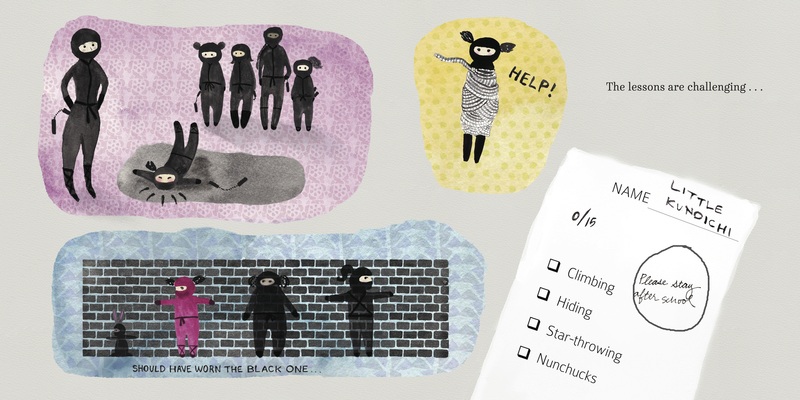 Little Kunoichi goes to a secret ninja school but she is not a very good ninja (yet!). She meets a little boy who attends a secret samurai school and together they get better at their respective skills in order to wow everyone at the island festival. How do they do that? Practice. This kind of heroine is so relatable because she’s not perfect but is persistent (which is more important). She’s also not someone who goes it alone, but who learns from others and has a close friend—all great qualities. Plus, I mean, she’s training to be a ninja. Sooooo, there’s that. Thanks to Little Bigfoot for images! 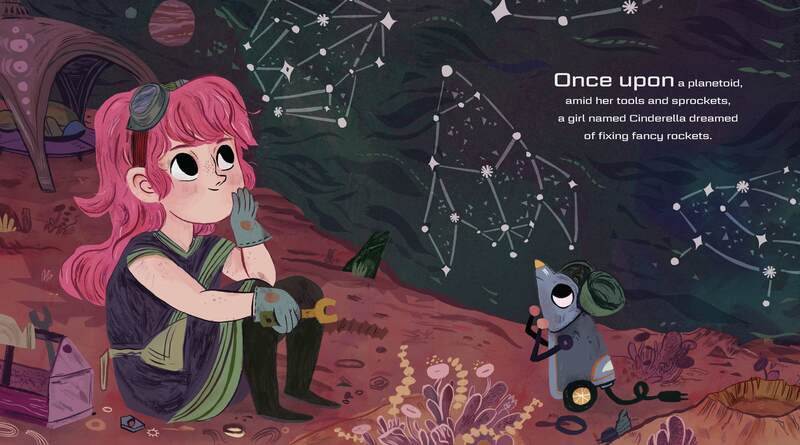 You might also be interested in my post on Rosie Revere, Engineer. Dream Recipes by ISOL (English edition, 2012). The Spanish edition is NOCTURNO: Recetario de sueños. This book demonstrates the true creative genius that is ISOL. She sets it up to be used, literally, as a way to guide dreams right before bed. You can pick a different page each night—charge it up, turn out the lights, and then see what appears and how it influences your dreams! This is a truly original book and nothing else exists that’s quite like it. Dream Journal. Book of discovery. Science project. 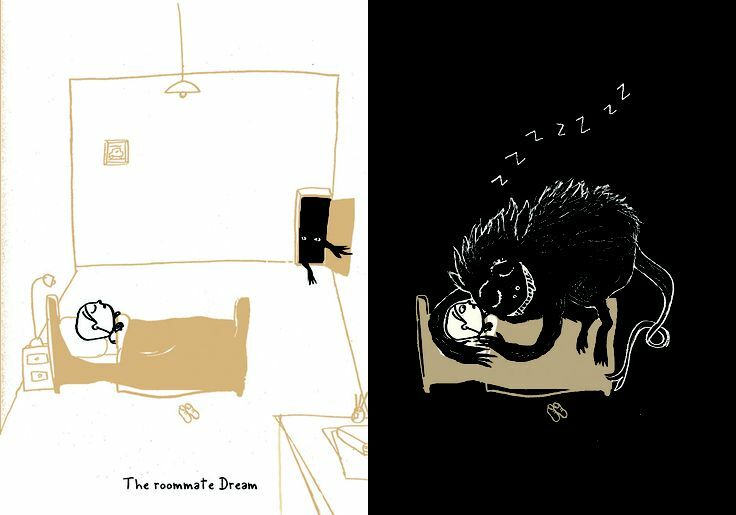 From “The distracted fisherman Dream” to “The Dream of being another” to “The Dream of the Dead Singer,” each has ISOL’s signature style. The very last page is blank (but covered in glow in the dark) for you to draw your own dream and see if it visits you! The Game in the Dark by Hervé Tullet (2012). 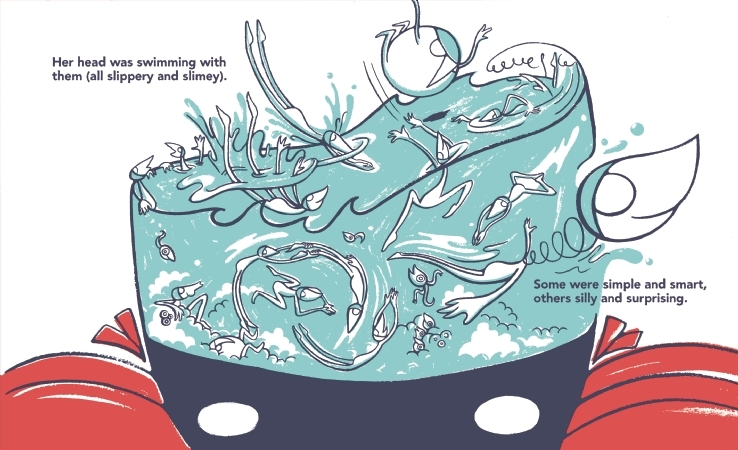 This one is much simpler and would be great for very young readers. Tullet is another creative genius for kids and here he plays with glowing spacey shapes. While simple they are still wonderful to behold. This gif from Babouches says it all! Wow! 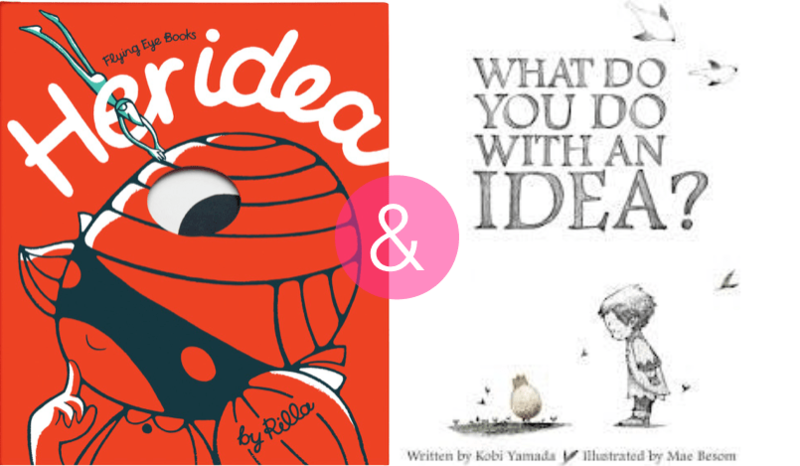 These two picture books are both about having an idea and where to go from there, one bold and one reflective. They show the amazing possibility that follows from nurturing your creative process. Come see! 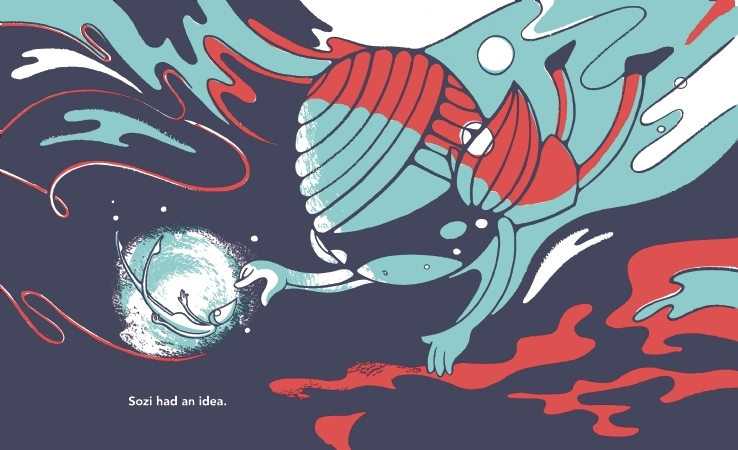 Her Idea by Rilla (2015). “The newest idea was always the best. The thing is, Sozi doesn’t do anything with her ideas. She lets them go until she doesn’t have any more. Because, as we know, they don’t last or stick if we don’t spend time with them. But Sozi has a helper, a book just like the cover of Her Idea! Together, they capture the perfect idea. The only problem then is figuring out the illusive end. That’s when things get pretty meta. Because we know this is Sozi’s story right? So Sozi is a character in her own book. The one we’re holding. They one we’ve just read. Which underscores the notion that if you nurture an idea, it will capture YOU! Thanks to Flying Eye Books for images! What Do You Do With an Idea? 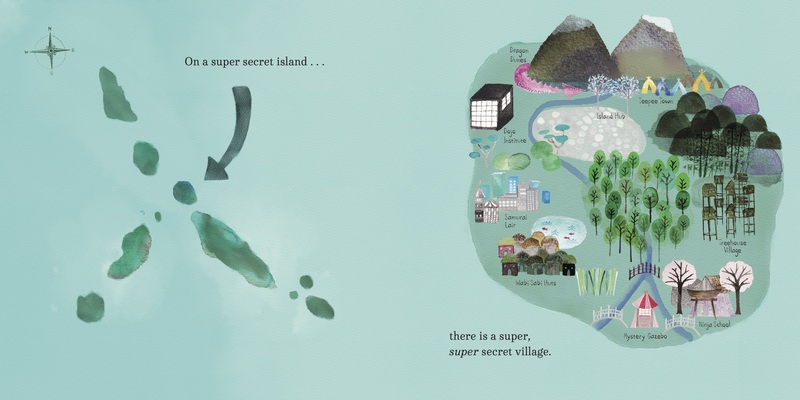 written by Kobi Yamada, illustrated by Mae Besom (2013). This book really gets to me. It truly is for anyone who’s ever had an idea and wondered what to do with it, regardless of age. Anyone who’s doubted whether or not to do anything with it at all. 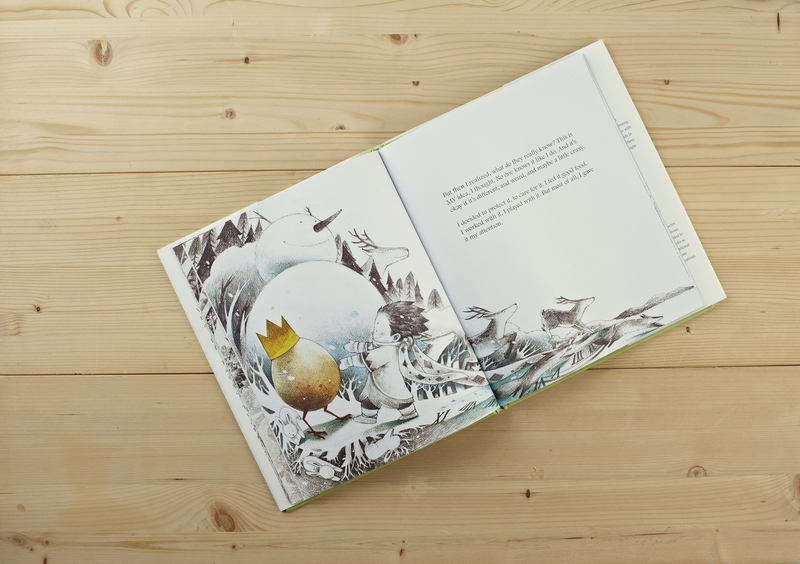 In the illustrations, there’s a child whose idea is embodied in a gold-crowned egg with legs. Yup. It’s perfect. Told from the first person, we hear what it’s like to be unsure, frightened, and to walk away from an idea. To disown it. But ideas can be persistent, as this egg is. And as the narrator begins to accept and spend time with the idea, it grows. In fact, through the seasons, the whole world changes because of this idea—from black and white to leaves of green to magically, vibrantly colorful. That’s how transformative ideas can be, when we give to them. They can change everything! Thanks to Compendium for images! 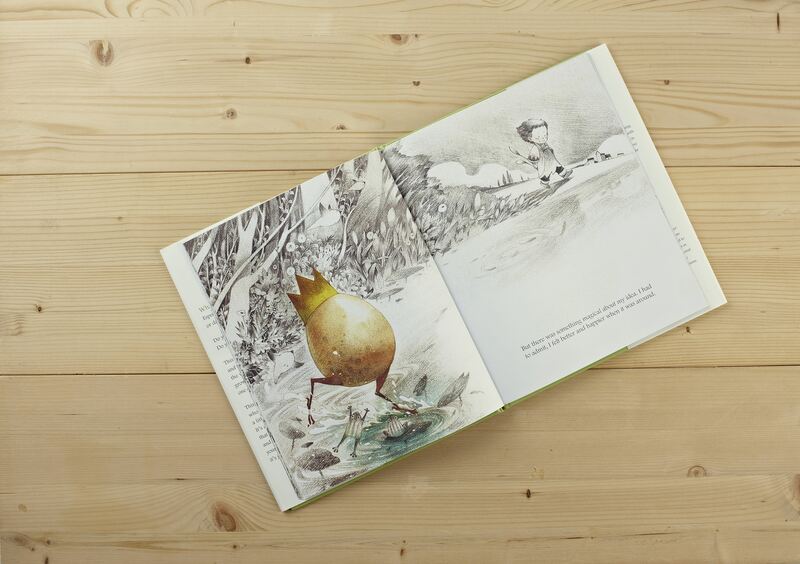 And now, a truly special giveaway that will spark a child’s (or your) own creative process! 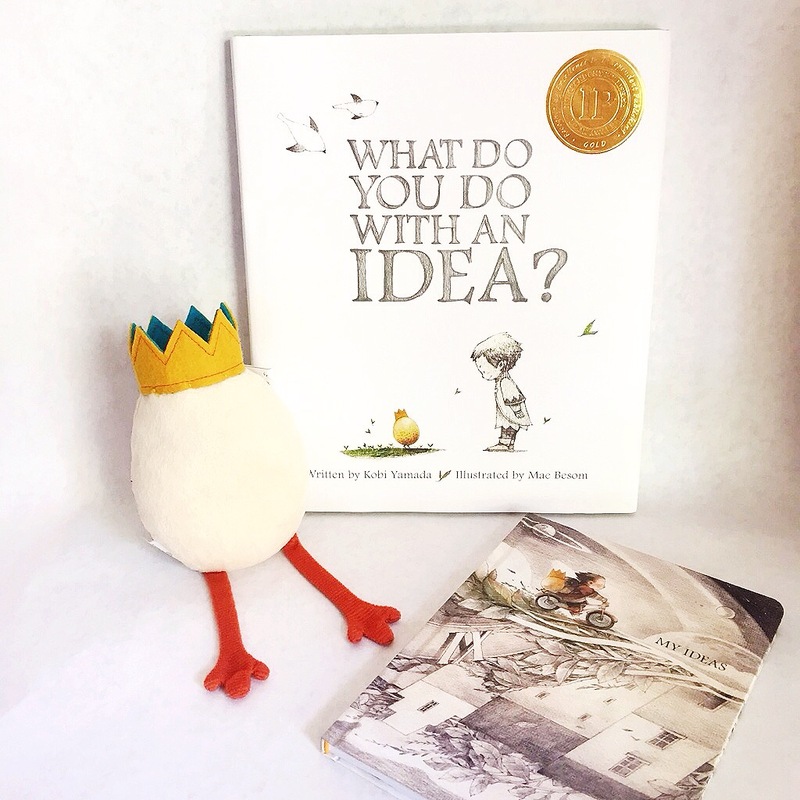 Compendium is generously giving away one prize package: the picture book, What Do You Do With An Idea?, a matching journal for recording ideas, and an idea plush toy! So inspiring! And that adorable egg! 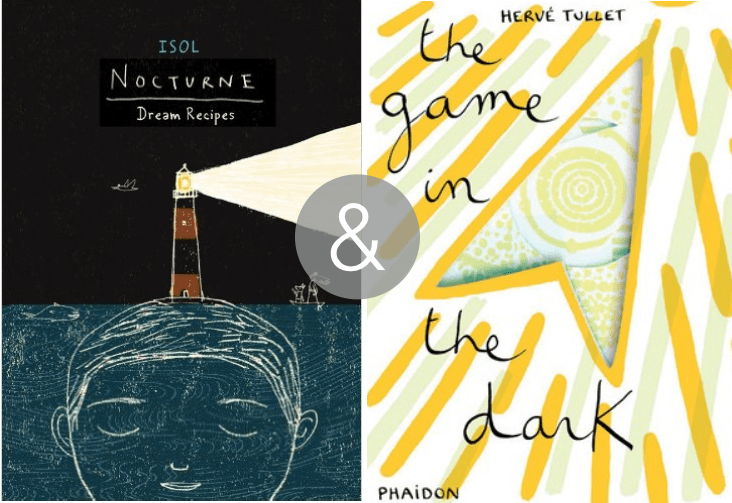 You might also be interested in a previous post: 15 Lessons on Creativity from Picture Books!